Amazon Price: $7.89 $7.89 (as of February 13, 2019 10:14 am – Details). Product prices and availability are accurate as of the date/time indicated and are subject to change. Any price and availability information displayed on the Amazon site at the time of purchase will apply to the purchase of this product. Silvertone Wedding Bell On A Card. 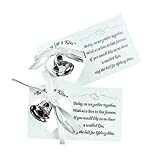 Ring in the happy couple's joyous occasion with these wedding bell cards! Set one next to each place setting at your wedding reception or hand them out after the ceremony. Each paper card is printed with a poem and has an attached silvertone metal bell. (50 pcs. per unit) 3 1/2"